For us, April brings snow, not showers, and it’ll be two more months before we see bits of green sticking up from the tundra. Still, it’s wonderfully bright, and already, the midnight sun is kicking in. Beginning April 9th, we won’t see genuine darkness until early September. We continually remind ourselves that the light which KNOM brings to our thousands of far-flung listeners is entirely thanks to you. Thank you for making our radio mission possible! 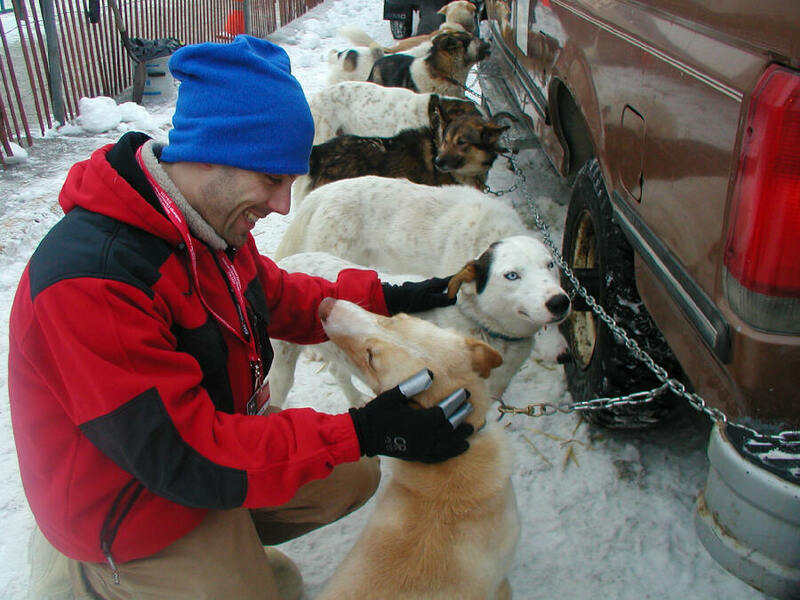 TAKING PAWS: (left) At the ceremonial start of the 2006 Iditarod Race in downtown Anchorage, news director Paul Korchin makes friends with two of musher Ed Iten’s athletes. 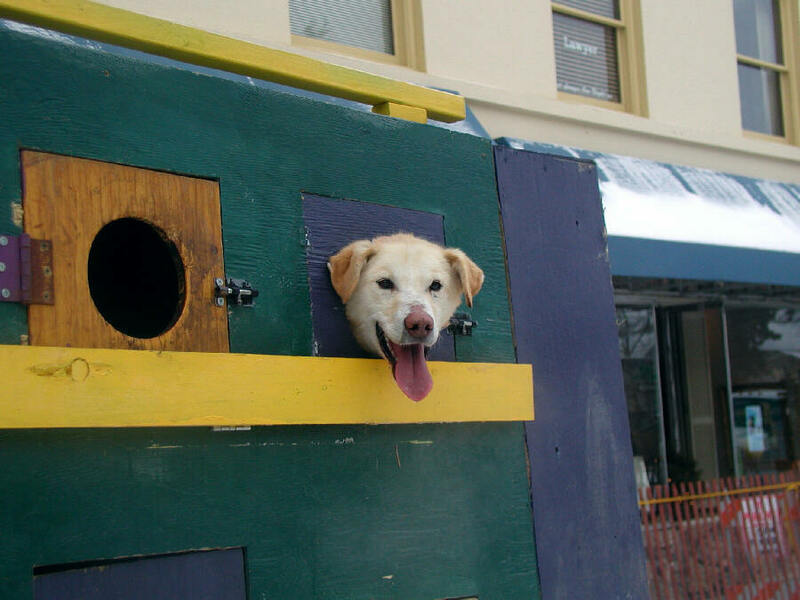 Eighty-three teams, including 1,328 dogs, embarked on the 1,150-mile wilderness trek to Nome. It was Paul’s 9th time following the thrilling event by small plane. FLAKY: After a week, city crews were still plowing the streets, following a string of blizzards that shut down Nome and dozens of villages. If it took us a while to reply to a note from you, it was because air travel and mail service were canceled for days due to drifts and low visibilities. For this region, violent snow storms are common, especially in February and March. IN THE AIR: KNOM general manager Ric Schmidt flew 3,800 miles to Washington, DC, for a National Association of Broadcasters’ leadership conference, and to lobby Alaska’s congressional delegation on broadcast issues. Weeks later, he was 1,100 miles from Nome talking with state legislators in Juneau. Ric was also in the air last month, sort of, teetering on a 13-foot stepladder in 50 MPH winds, tossing salt at KNOM’s rooftop satellite dish, in order to melt snow and ice that was blocking its signal. INSPIRATIONAL SPOT: The creator of Mount Everest also made the comparatively minuscule people who climb it. We mustn’t be so awestruck by God’s power that we forget He’s also concerned about each and every one of us. INSPIRATIONAL SPOT: The question is not whether the world can go on without me, but whether it’s going to be any better because of me. 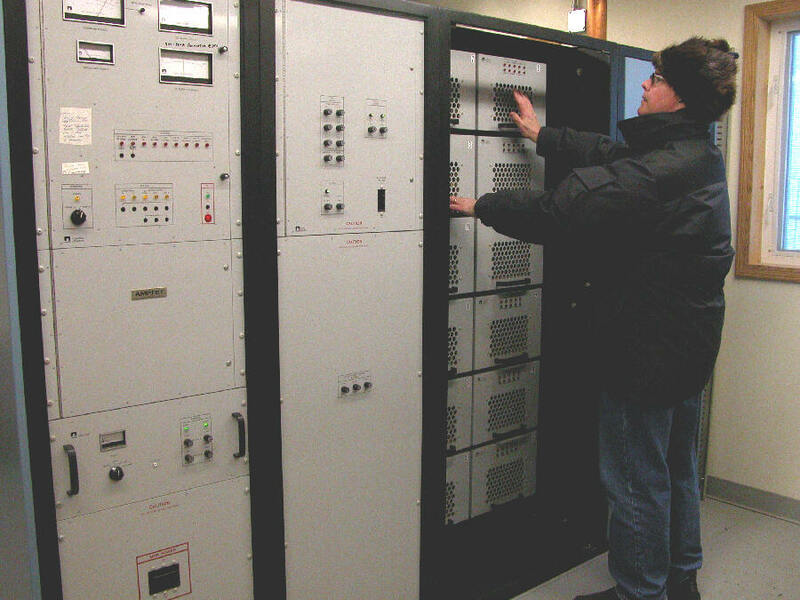 TAKING THE HEAT: (left) On a visit to Nome, KNOM financial officer Tom Busch checks the exhaust of the AM transmitter power modules for temperature abnormalities. KNOM’s founding chief engineer and later, its 30-year general manager, Tom and his wife Florence now live 539 miles away in Anchorage, where he concentrates on KNOM fundraising. MIRACLE: Speaking of Florence Busch, a few weeks ago, she was diagnosed with what appeared to be a fairly advanced colon cancer. A surgeon was able to remove the entire growth, and confirm that it had not spread. You can imagine the Busch family’s relief! Today, Florence is recuperating at home. HURRAY FOR APRIL 27th: That’s the first day in spring, on average, when Nome’s high temperature creeps above freezing. YOU CAN BANK ON US: If you walk into Nome’s bank, or into its grocery stores, or even into City Hall, you’re liable to hear KNOM, which is a positive, clear favorite among western Alaskans for hundreds of miles. You’ll find the same thing in most village homes, in which you’ll find KNOM a constant friendly presence. Thanks to your help, thousands of people every day tune in for programming they find interesting, entertaining, helpful and inspirational. Thank you! NET RESULTS: Thank you for joining us at www.knom.org. We invite you to browse around. Welcome! Please consider adding the KNOM mission to your will. We prayerfully place all bequests into a fund that will provide for major improvements and emergencies for this, the oldest Catholic radio station in the United States. INSPIRATIONAL SPOT: This day is a gift from God. Will I keep it just for myself, or share it with others? INSPIRATIONAL SPOT: People see God every day. They just don’t recognize Him. TO YOUR HEALTH: (left) KNOM volunteer news reporter Jesse Zink is extra busy these days, lending a hand to the Nome Volunteer Ambulance Department. Jesse took a class which met for four hours two nights a week from early October through the first week of February, as well as an occasional Saturday. 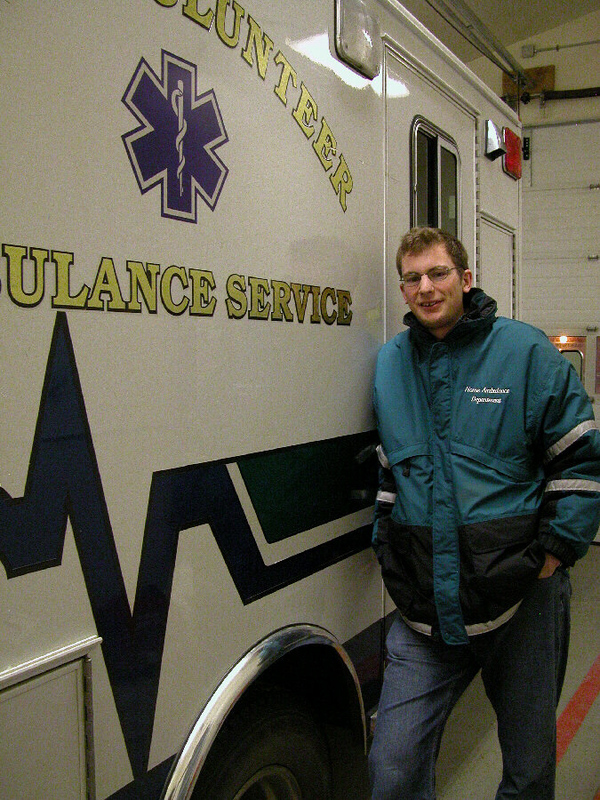 He passed the written and practical exams in February, and is now certified by the State of Alaska as an Emergency Medical Technician I, which is the first of three certification levels. As a member of the unpaid ambulance service, Jesse is on call for eight 12-hour shifts every month, prepared to respond to emergencies via the city’s pager system. Further, he is required to keep the pager with him at all times in the event of a disaster. WE SPOKE TOO SOON: Last month, we reported what we believed was the first verified reception of KNOM by a radio hobbyist in the Lower 48. It turns out to be the second. The report of the first, from Sherwood, Oregon, on January 12th at 12:21 AM Alaska time, reached us in March. Over the past month, we’ve received recordings from long-distance radio fans indicating that Jesse Zink’s voice was heard in Sweden, Ric Schmidt’s was heard in Australia and Amy Flaherty’s was heard in Norway. All three were also recently heard in Japan! INTENTIONS: We receive many requests for prayer from friends and supporters. Some face illness, or the illness of a loved one. For some, it’s the loss of a spouse, or someone else who was dear to their heart. Some are worried about children who no longer attend church or who have lost their faith. Please join us in prayer for all of these members of the KNOM family and their intentions, won’t you? INSPIRATIONAL SPOT: Kindness gives birth to kindness. INSPIRATIONAL SPOT: I wondered why somebody didn’t do something. Then I realized that I was somebody. 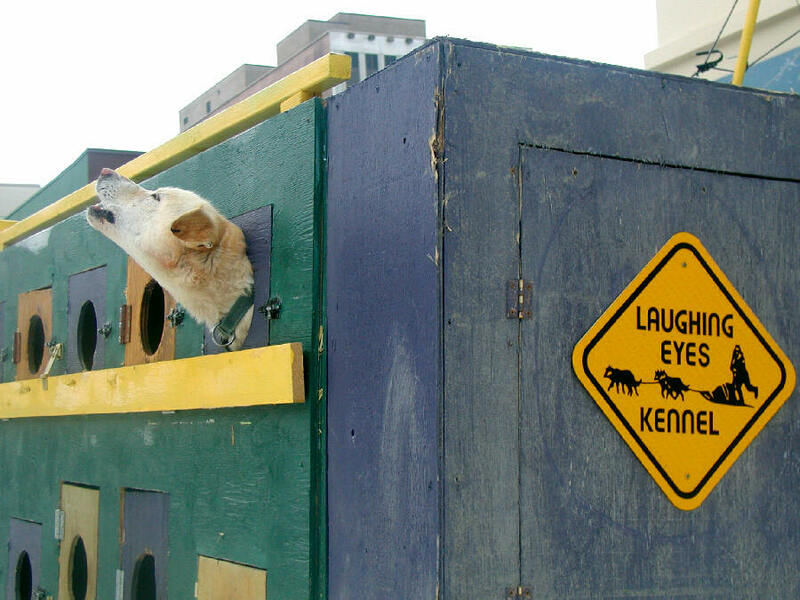 COZY: (left) At the 2006 ceremonial Iditarod start in Anchorage, public affairs director Amy Flaherty caught this picture of a contented team member in musher Hugh Neff’s dog truck. These home-made plywood doggy apartments on wheels, built on top of pickup trucks, are the way that most sled dog teams travel in comfort and style. (left) Sometimes, there's nothing like a song. AROUND THE CLOCK: From 9 PM to 6 AM, KNOM’s programming is usually automated, run by computer. If there’s a problem, the computer calls general manager Ric Schmidt at home. Iditarod teams finish the race at all hours, however. And so, for a week, the KNOM staff work extra time, staffing the station overnight as well as during the day. Whew! With only eight full-time staff, you can see that this extra round-the-clock burden takes remarkable energy, dedication and courtesy, which KNOMers thankfully have in abundance. THIRTY YEARS AGO: In April 1976, KNOM reported that King Island elder Aloysius Pikonganna, crabbing two miles from shore on the ocean ice, bagged 92 crabs in five hours. A special dinner that month celebrated Therese “Tweet” Burik’s completion of 12 years of volunteer service to the mission. RECENTLY SPOTTED: Since January first, KNOM has broadcast an incredible number of spots, 11,300 inspirational spots and an equal number of educational ones, thanks to you. Yes, the award-winning service which KNOM has provided since 1971 is made possible entirely by your generous gifts to the isolated people of western Alaska. May God bless you abundantly for your help!